The triangular flag with emblem of Paramashiva and Nandi – is the State flag of the Nation of Kailaasa. It is called as the Rishabha Dhvaja. This form of Paramashiva, this cosmic form with 25 heads and 50 hands is the most powerful, ultimate form as He Himself describes in Agama. In Sanatana Hindu Dharma, the Kaavi (deep maroon) color is associated with Thyaaga (renunciation with right context) and Sanyas. It is because of the sacred Hindu Sanyas order (Hindu monk) that Sanatana Hindu Dharma is available to humanity today. Many gave their lives protecting the sacred scriptures, temples, knowledge, Gurukuls and deities. Kaavi symbolizes their sacrifice, commitment and integrity to Sanatana Hindu Dharma. All Kailaasavasis & Hindus all over the world are welcome to download & print the Rishabha Dhvaja, and hoist it to declare your Integrity & support for the Hindu Nation Kailaasa (in accordance with your local and national laws & protocols for flag hoisting). 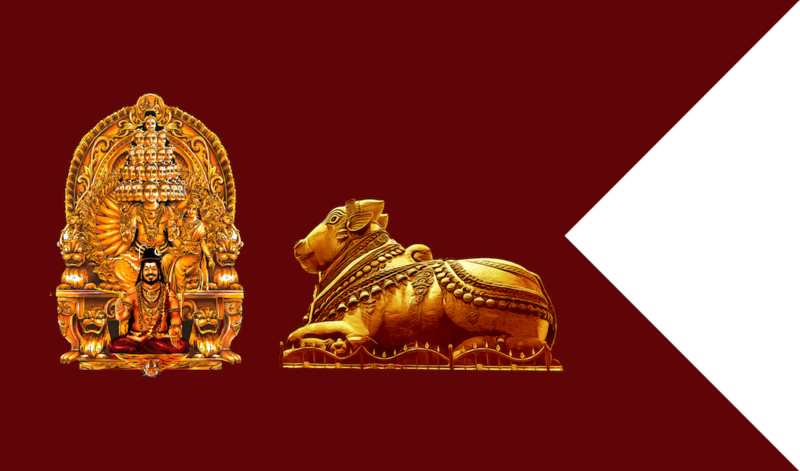 The Emblem on the State Flag is that of Paramashiva and his vehicle Nandi. Paramashiva is shown in His form with 25 heads and 50 hands, with Devi Parashakti sitting on His lap. 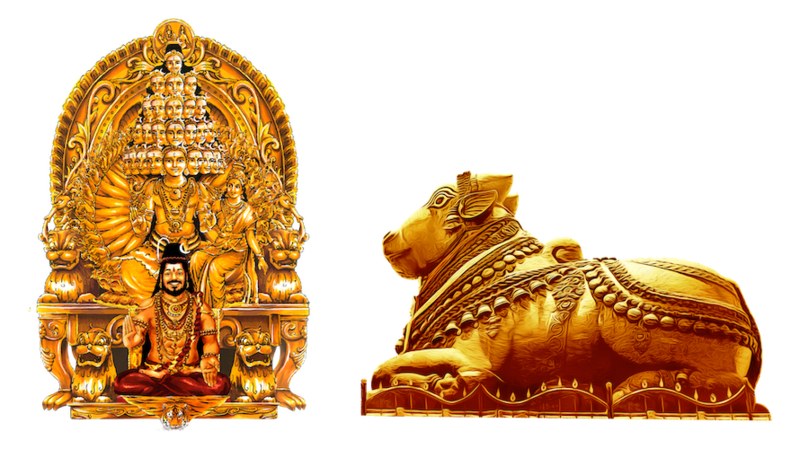 The incarnation of Paramashiva, His Divine Holiness Sri Nithyananda Paramashivam sits below Paramashiva and Parashakti. Paramashiva’s loyal and devoted disciple, Nandi in the form of a bull is shown in a sitting posture facting Parmashiva. It is in this posture, with Devi sitting on His lap, that Paramashiva revealed the Agamas to Devi Parashakti, the sacred source scriptures of Sanatana Hindu Dharma which are an embodiment of the ultimate truths of life.